Diesel brings out its Men’s Look book for AW’14 and , as expected , brings out extreme distressing , washed down super darks and mostly skinny fits. The men’s and women’s lookbook both share a common vision and direction and mixes alternative spirit with rock and roll attitude. Distressed denims and embellished leather recall the reckless nature of underground icons. Experiencing the future doesn’t (necessarily) mean we have to lose touch with the past. Thus, Diesel denim is going back to its roots, returning to a time of pure denim and authentic treatments with A D.N.A . : re-evolution. These washes pay homage to our heritage: abrasions and repairs, selvedge and pure dirty washes. A D.N.A. : re-evolution to dye for. Features: Traditional design with iconic details: pure elementary. The corners of the back pocket are manually folded. Thus, the proportions on the back create a compact and risqué design. The leg shape slightly narrows at the bottom. Features: Multi layer darts allow a distinctive movement. Rivets are placed in key areas making them visually stunning, and drawing attention when moving. 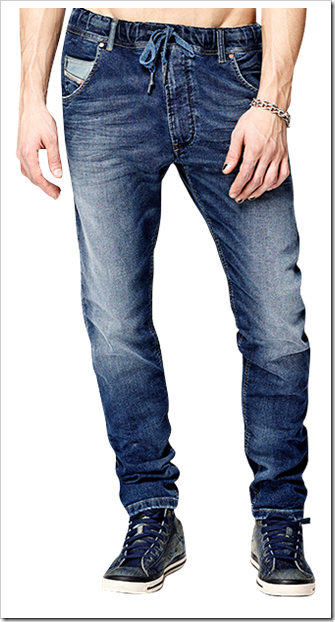 The hidden yoke taken from the chino silhouettes give the Denim their tailored look. Features: “Tradition”, so full of positive connotations. All of which perfectly fit these Denim. The stitching perfectly replicates the patterns of old school sewing machines. The “v” shape yoke and regular waist embody how denim used to be designed. The thigh measurements fit a variety of different body shapes. The tapered leg matches formal and informal shoes while the back features a distinctive look thanks to the slanted back pockets, designed to follow the body shape. And the cherry on this cake? A dedicated coin back patch. Features: A distinctive low waist design that guarantees a compact effect and a “cool walk” (don’t ask us what that is, just imagine it). The design of the thigh compliments the shape of your thighs. A hidden back pocket can be useful for concealing… Well… Whatever. Truly the pinnacle of experimentation and craftsmanship. Available in an extremely limited number of pieces, each denim is meticulously handcrafted in Italy. The washes and treatments are pushed to the extreme, exploring the unknowable boundaries of Denim. Absolutely everything you would expect to find in a Diesel Denim collection. The washes you expect, no, demand to find in any denim collection worth its salt. Features: a low waist, low crotch and tapered on the lower part with strings on the waist to adjust the fit using the “jersey denim” or the “Knit Denims”. Features: A low waist, low crotch and tapered on the lower part with strings on the waist to adjust the fit. Features: With a low waist and distinctive slimmer yoke to emphasize the body shape. The extended stitching construction in the internal leg area emphasizes the crotch. Nice to see distressing on the ,not so easy to work on , “knit denims”. Features: The archetypal traditional design: low waist, button front fly and the leg shape slightly narrowing at the bottom.